It seems just yesterday we were captivated by the dual-core processors within Android smartphones, yet this bit of news makes them less appealing. What’s better than 2 cores? Not 4, but 100! 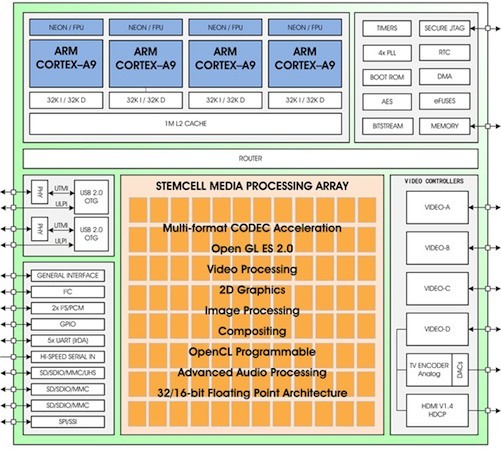 href=”http://www.ziilabs.com/” rel=”homepage” target=”_blank” title=”ZiiLABS”>ZiiLabs has managed to incorporate 96 “StemCell Media Processing” cores to work alongside the four ARM Cortex A9 cores. I myself have no idea what to expect from real world use of the technology, but processing and acceleration benchmarks are probably outstanding. The ARM Cortex A9 CPU’s are clocked at 1.5GHz, and they are said to drastically reduce power consumption thus improving battery life for extended use. The chip was made with Android 4.0 (Ice Cream Sandwich) in mind, so maybe we’ll end up seeing it within some devices next week at CES. Singapore – ZiiLABS, a pioneering media processor and platforms company (a wholly-owned subsidiary of Creative Technology Ltd), today unveiled its ground-breaking 100-core ZMS-40 StemCell Media processor optimized for Android. The ZMS-40 combines 96 of ZiiLABS’ StemCell media processing cores with four 1.5GHz ARM Cortex-A9 CPUs to deliver stunning multi-tasking application and media processing performance. By doubling the number of StemCell Media processors compared to the previous ZMS-20, the ZMS-40 delivers twice the peak media performance, while running the larger array at lower clock speeds to achieve the same performance leads to greater energy efficiency and a reduction in power consumption of up to 50 percent. With 2X the performance and 2X the power efficiency, the ZMS-40 delivers ground-breaking media capabilities to handheld devices such as tablets, including ultra-high-resolution H.264 HP decoding of up to 3840×1080 for true 1080p 3D stereo, a rich and interactive desktop browsing experience, 2560×1600 (WQXGA) display resolution support, higher-quality video encoding and immersive OpenGL ES graphics and future support for High Efficiency Video Coding (HEVC). “We are already working through the draft specifications of High Efficiency Video Coding (HEVC) and expect the flexibility and performance of the ZMS-40 to meet the challenging computation complexity of this emerging CODEC in order to deliver higher-quality and lower bandwidth.” said Tim Lewis, Director of Marketing at ZiiLABS. Creative is a worldwide leader in digital entertainment products. Famous for its Sound Blaster® sound cards and for launching the multimedia revolution, Creative is now driving digital entertainment on the PC platform with products like its highly acclaimed ZEN® MP3 and portable media players. Creative’s innovative hardware, proprietary technology, applications and services leverage the Internet, enabling consumers to experience highquality digital entertainment – anytime, anywhere.